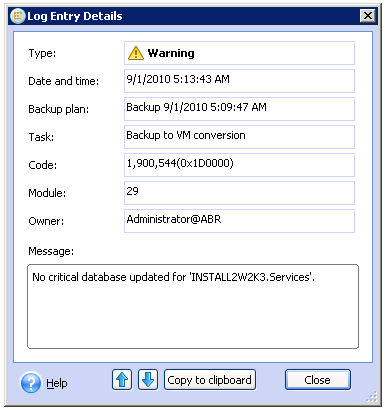 19869: Acronis Backup & Recovery 10 Shows Warning Message in Log "No critical database updated"
(!) The exact text of the error message may slightly vary and depends on the operating system in the backup file that you restore or convert. This is an internal service warning. Such warnings can be safely ignored, their presence in the recovery or conversion log doesn't affect the system bootability or integrity. Acronis Development Team is working on eliminating this confusing message from the logs. This article will be updated when a fix is available.